Prime Minister Peter O'Neill has defeated a vote of no confidence with parliamentarians voting 85-21 to defeat a Opposition-sponsored motion. The Opposition led by leader Don Polye argued vehemently for them to be given more time to debate the motion before the vote is taken. But that didn't happen with the ruling coalition using its superior numbers to push for the vote to be taken. 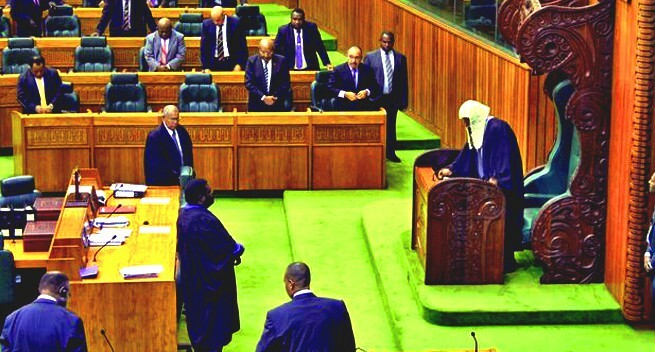 Western Highlands governor Paias Wingti was among notable MPs who voted with the Government, despite reports early in the week aligning him with the Opposition. Ben Micah says there is no truth involved in the formation of every government. He said there is always lie and avoiding of the truth whenever a government is about to be formed. Speaking from the opposition bench during the resumption of the vote of no-confidence in parliament today, Micah said he had no issue on the kind of leadership of Prime Minister Peter O'Neill but for the interest of the people, he urged the PM to listen to the cries of the people and step aside. Founding father of the nation Grand Chief Sir Michael Somare said he was concerned about the economic situation of the nation and had to move to opposition and vote for the opposition despite the loss today.
" I cannot understand how our economy is managed. Despite 250 shipments of Oil and Gas so far, there is nothing to show for, " Sir Michael said during a press conference after the parliament sitting. He said one shipment is around USD$220 million and questioned why the government keep borrowing. "The banks are saying there is no money. There is also cash flow problem in the country and the government should explain the truth on why this is so," Sir Michael added. He said Prime Minister Peter O'Neill should tell the people the truth about the economic situation affecting the country.